Ask any driver who’s been doing this for a while, and they’ll tell you Schneider is a great place to start your driving career. Seriously, go ask them. Or discover it yourself, like tens of thousands of drivers before you. No experience? No problem. We’ll walk you through every step, so you can confidently make a change and provide for yourself and the people who matter most. Curious but not convinced yet that driving is for you? Once you realize all the benefits that await — many you never hear about — the fear of the unknown will fade, and the confidence will come. Once you’re convinced driving is for you, don’t get stuck in neutral! Here’s where the rubber hits the road and you make it happen. We’re here to help make it easy for you to start your new career and get earning what you deserve. Every job has a learning curve, but it’s a lot easier when you know what it’ll involve. Consider this your road sign so you can know what’s coming, navigate it when it arrives and get to full speed quickly. Driving school will give you a great start. We’ll take your skills to the next level with our paid orientation. Our training team has earned its reputation as a leader in the industry. Here’s why. The classic entry-level dilemma: You need experience to get a job, but you need a job to get experience. Not here. 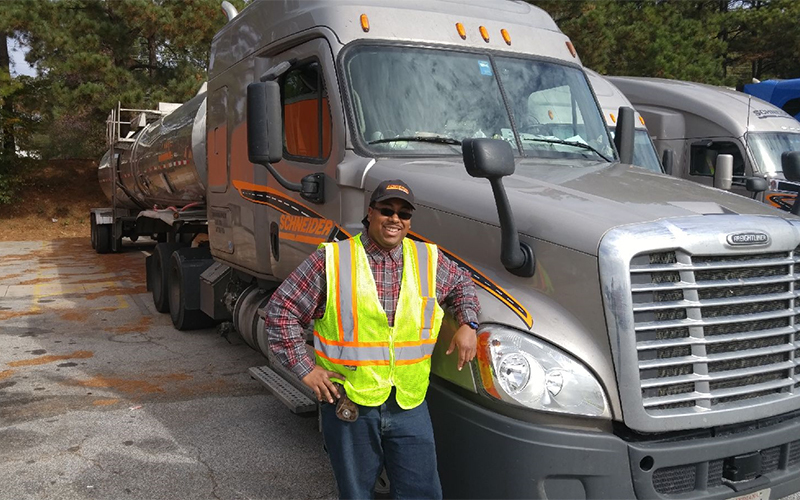 For many of Schneider’s truck driving jobs — no experience is required.